The Christmas for Refugees program began in 2013 in with Christmas parties for Christian refugee children from Iraq and expanded to Lebanon in 2014. 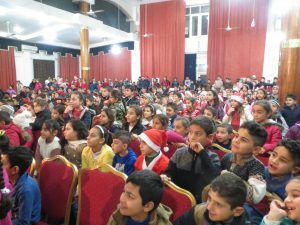 In 2015 the program grew again to include Christian refugee children in northern Iraq who had escaped the Islamic State as it advanced into the traditional Christian homeland of the Nineveh Plain. Thousands of christian families were also forced to flee Mosul which the Islamic State still holds. Most of the Nineveh Plain has been liberated from the Islamic State (ISIS) including the Christian towns of Bartella and Qaraqosh. Most dwellings in the Christian towns have been burned out of leveled and there is no power or water. Families can still not return but cleanup is underway. If these towns are habitable by Christmas, 2017 Christmas for Refugees will offer programs for the children in their home towns. Please pray for the Christian families of the Nineveh Plains and Mosul. Watch the short video below made inside the one of the Christmas parties in Iraq. Help make Christmas. 2107 bigger and better for Christian Refugee children. Donate now!